Register Log In ECN Forum Forums Violation Photo Forum Weatherproof Outlet? Customer had a problem with the GFI in the garage tripping in wet weather.... 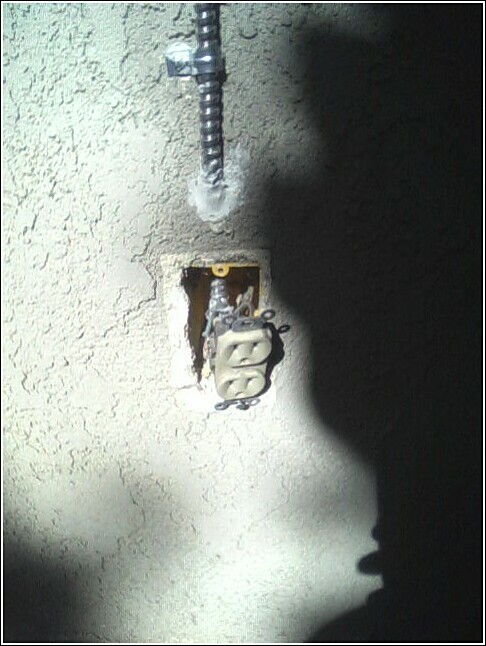 Didn't seem to start till the handyman added the outlet on the patio! You do seem to come up w/ some doozeys,more stuff that belongs in the scrap yard. C'mon, give the handyman a little credit, at least he knew to use a W/P box and cover!! 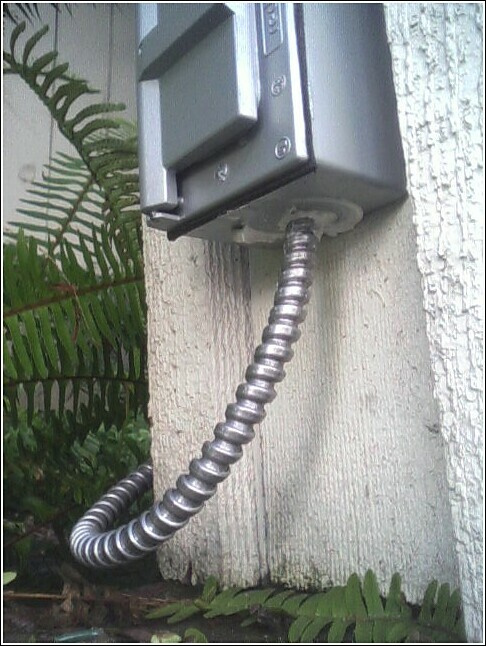 Shouldn't that outdoor socket have the cover flap facing downward?. Norcal is right, you must be hot on the trail of these guys !!! Gotta love the MC cable outside as well! Had a call for a possible fire in a house about 8-9 years ago, in the middle of a f-r-i-g-i-d winter spell - something like -25 nightime. (Cold, even for Chicago) Turned out that someone had wired a side light for the house (old round w/p box) with bx, and failed to install a 'drip loop' (basically installed it indoors through a hole to the outside w/p, but somehow it became a drain tube as well) the resulting corrosion finally generated enough heat to start scorching the trusses in the attic, resulting in our being called for "smell of smoke". Caught the fire before it progressed out of hand.